Best Maid has been cranking out their popular line of pickles and relishes since 1926. 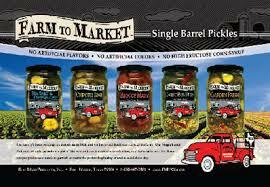 The Dalton family founded the small, Texas based company and grew the operation into a major pickle distributor with products featured by national retailers like Sam's Club and Amazon.com. The Best Maid product lineup is extensive. They jar everything from pickles and relish to peppers and dressings. One of their newest sets of products is also one of the most exciting. Their Farm to Market Single Barrel Pickles emphasize quality, natural ingredients starting with pickles right off the vine. Farm to Market aren't your grandmother's pickles. With flavors like Bloody Mary and Chipotle Lime, Best Maid has taken pickles in the world of gourmet food. I was fortunate enough to get samples of some of these unique pickles. Below is my take on four of the Farm to Market flavors. Chipotle Lime: Chipotle and lime are a pretty common flavor combination. However, in a pickle jar, these flavors may sound odd. These pickles are sliced and brined in a jalapeno vinegar. The jar even contains a fair amount of jalapeno slices. The resulting brine is a somewhat milder version of what's typically found in jarred jalapenos. The vinegar is definitely dominant. It's a bit more tangy than most pickles that I've tasted. There is a definite citrus element in the flavor. Oddly, there is no mention of lime in the ingredient list. The pickles finish with a definite kick. They aren't as hot as pure jalapenos, but they definitely left my lips tingling. The flavor combination was a little hard to get used to. Honestly, I never did get to the point where I could just snack on these pickles out of the jar. I did, however, find a good use for them. They added a great tang and spice to sandwiches. Try pairing them with grilled/BBQ chicken sandwiches. Garlic Baby Dills: Baby dills are a staple on relish trays for all of our family dinners. Farm to Market Garlic Baby Dills ratchet up the flavor of this old favorite with tons of garlic and just a bit of red pepper. The clear vinegar brine seems to have almost as much garlic as cucumber floating in it. These baby dills are tangy, extra crisp and loaded with garlic flavor. Strange as it seems, the garlic actually seems to balance the intense vinegar tang. As a result, these baby dills were probably my favorite of all the Farm to Market flavors. Sea Salt & Pepper: These pickles are a variation of my favorite potato chip flavor. Crisp cucumber slices are soaked in a salty brine and accented with plenty of fresh black pepper corns. The brine on these pickles is really intense. It's equally salty and tangy with a slight black pepper accent. For me, the brine was just too much. I enjoy a tangy dill, but the salt and vinegar was overwhelming. Bloody Mary: Without a doubt, this is the most unusual pickle flavor I've ever seen or tasted. Being a non drinker, I've never actually had a Bloody Mary for a comparison. However, all the key elements are present The flavor of these pickles is an odd blend of tomato, tangy vinegar, and spicy heat. Though the jar only contains celery seed, there is also a distinct celery flavor. Bloody Mary drinkers will probably appreciate these pickles more than myself. I have a hard time picturing what I would pair them with. Pickles at brunch don't quite seem to fit. I really respect and appreciate what Best Maid has done with their Farm to Market pickles. Stepping this far outside the box isn't always easy for a company that has flourished on a quality, traditional product line for nearly 90 years. While I didn't personally love every flavor, I was really impressed with creativity. 0 Response to "Best Maid Farm to Market Pickles"